Yes, very good news. MPM is a good chap and will do even better on that corner I am sure. We have let the next door unit too!!! In the meantime, if anyone wants to take their old unit in Cannon Street, I should have the keys very soon MPM! little more than "dumping grounds" for people with problems, an influential think-tank claims. and unemployed people or ex-offenders than tourists, according to the Centre for Social Justice. comparable those seen in deprived inner city areas, it finds. Dover is doing well with full shops at this time would like to see more full up, but overall things are on the up in the town centre. London Road is having a bit of a resurgence with new shop openings. I'm doing a feature in the next couple weeks for the LRCF website. I'll keep you posted. i noticed the other day a new shop at the front of the charlton centre called "tel boy's". kieth,i think they referring to margate,with thanet in genral as a dumping ground.the rent is cheaper. Sad indeed, "contacted shortly" does not sound like "reimbursed promptly". Dover is still losing the battle of the high street and has a long way to go to attract shoppers back, Canterbury on the other hand is still a place where many, who live outside of London, will go to shop. Folkestone is also making the right noises as regards development and just may grab the attention of the lucrative tourist trade too! sorry to hear about "beddy buys" bought 2 beds from them in the past and had great service from them. We have had several beds from them, very sad they are finishing. speaking to mr capper [butcher Charlton center] the shop will be back in a fortnight.the chap who used to run the shop has had a heart attack and a stroke,now has desided to return to his folkestone based shop to trade.his manager of the Folkestone shop will take over the Charlton center shop soon. 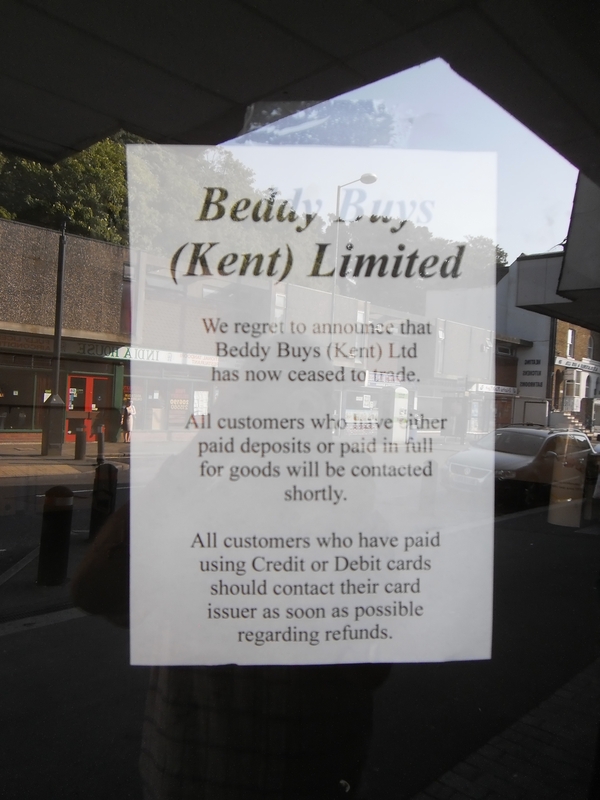 Beddy Buys shop in Folkestone has closed and there is a notice on the window identical to the one on the above posting. They will not be back in 2 weeks, Mr Capper was having you on Brian. Mr Capper would have been relaying what he had been told and would not deliberately mislead anyone. Yes Glyn has a wicked sense of humour we have had many a laugh together, but I still do not think he would have said that unless that is what he had been led to believe. went through Charlton center this morning,and there was beds in the old beddybuys unit.you can just make them out through the white washed widows [the gaps init] that is.